When Ames and I decided to buy the Civic, we wanted to try to sell our 1997 Camry outright instead of trading it in. The one thing we forgot was how picky people are when looking at used cars. Okay, so its not a fancy car, never was. There is no Jaguar logo lights or heated seats, and the paint is not in the best condition, but the thing runs good and has less than 100k miles…and it’s a Toyota – so it’ll run forever, right? Anyway, the biggest complaint we’ve had from test drivers is that the gas pedal sticks. Yea, well…we’ve known that but never thought it was worth getting checked out. When you go to press the gas pedal, the initial touch of the pedal sometimes requires a little force, sometimes you almost have to stomp on the gas to get it to go. A while ago, I tried squirting some WD40 wherever the wire was exposed thinking it was a friction issue…but no dice. While buying a car, I would advise you to get a loan from the car dealership as doing this speeds up the process of owning a new car, and as all paperwork is in one place thus, the process gets less confusing. Amy and I both ended up Googling for a solution on the same day (after our last potential buyer decided he wasn’t interested) and found that the solution was simple. According to the forums and websites that we found, the problem was that the butterfly valve that allows air into the engine is gunked up by carbon deposits and is getting stuck. Sounds complicated to fix, but it really, REALLY isn’t. A friend (or spouse) who’s willing to sit in the car with their foot on the gas pedal for about 5 minutes. If you can park your vehicle so that the passenger side is higher, than the the driver side, great! If not, no worries, you’re just going to make a lot of smoke. I’ll explain later. Turn the car off, open up the hood, and look for the large black flex pipe that runs from your air filter to the top of the engine. There should be a metal wire on a pulley near where this pipe connects. When you press your gas pedal, this pulley turns, opening up the valve that lets air into the engine. This valve is what needs to be cleaned. To remove the hose, you’ll need to loosen up the hose clamp with the screwdriver. Once the clamp is loose enough to move around, pull the pipe off of the throttle body and push it to the side like the picture below. Then, push a wad of paper towels under the opening. This is not a picture of our Camry, but is mechanically very similar. This is the part where you need someone to get in the car and hold the gas pedal down. DO NOT start the car. You’ll notice that when they press the gas, the circular butterfly valve inside the throttle body will be open like the picture above. With this valve open, you’ll want to attach the little plastic straw to your can of carburetor cleaner (which is about $3 at an auto parts store) and saturate the inside of the throttle body. Be sure to get the entire surface of the valve flap as well. This should loosen up some nice black gunk around where the valve usually touches the walls of the throttle body. Use your toothbrush to scrub the walls and the flap as thoroughly as possible. If you can still feel grit around the edges of the flap, or the groove where the valve touches the walls, keep scrubbing and squirting carburetor cleaner as needed. When you’re done scrubbing, wipe up as much of the carburetor cleaner as you can. 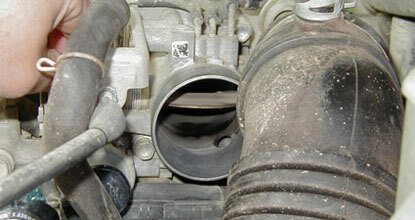 Push the black hose back on to the throttle body, and tighten the hose clamp. Now this is the fun part. Crank you engine and let the car sit running for a few minutes. Depending on how much carburetor cleaner is still in your throttle body, your car exhaust will put off a nice steady flow of white smoke. We must have had quite a bit of cleaner left in ours because it made quite a spectacle. I’m talking voluminous puffy white clouds. I think everyone walking or driving by felt bad for us – like our car was dying or something…but it WILL go away. After about 5 or 6 minutes I ran up to the apartment, grabbed my camera, and took the picture below. This was nothing compared to the opaque gases we were making at first though. The result: The acceleration on the Camry has never been smoother. Instead of having to stomp on the gas, it responds appropriately to the lightest touch. Ahh…I love do it yourself repairs when they actually work. It is suprising to me that a car that new would have such a problem. It’s not carbureted is it? I wouldn’t think so, but by the looks of that picture it has me thinking otherwise. Justin all gas powered cars have an air intake. The engine is a basically an air pump, air comes in one side and comes out the other. What Jason left out is the reason you spray around the butterfly with the car off is that you don’t want to get extra grit that’s in the air, in your engine, as that would pretty much destroy it. I suppose if you use those cheap air filters you can end up with this sort of problem a bit earlier than you should. (Not that Jason would do that, just shooting from the hip.) I can usually find the OEM version of my air filter in the parts store for a couple bucks more than the cheap paper. I don’t recommend trying to save a few bucks on your air filter or your oil filter for that matter, you get what you pay for and saving a few bucks now could lead spending big bucks later. B, you’re my new mechanic…and programmer – however that works out. When it comes to buying air filters, I go to Discount Auto Parts and tell them I want the cheapest one they got. Perhaps I’ll opt for a better one in the future. Oh! And Ray, you should have your wife come out just as you’re ready to crank it up. Sure to impress, and she’ll never let you touch “her car” again. hehe. Hehe, I know all cars have an air intake. It’s just that on the cars I have had that are fuel injected (VW Buses and Vanagons) do not have an easily accessibly buterfly valve (where the air intake tube meets the throttle body). Crazy Air Cooled VWs… My first car was a 71 VW Bug. Yeah, I love ’em though! I’ve got all water cooled now (imagine, a real heater that actually works!). My Vanagon is 4WD (Syncro), it’s a keeper. I may have a same problem with my Accord. Interesting thing is if I press the gas pedal beyond that initial sticking point, then start the engine, everything is normal. Also, it only happens the first time with a cold engine start. The solution here would apply to my case too? I am excited. My camry’s pedal has been sticking for months, and my husband and I have not figured out what to do about it. I actually am going to try this myself with my 13 year old son. (My husband’s answer to everything is to call someone else.) Your directions sound very clear and simple, so I hope I am not overly confident on something I shouldn’t be fooling with! I’ll let you know how it goes. Yea, I’m not expert with cars, but I don’t think there’s much room for error. We were really worried about the smoke that it makes initially after you get it back together, but that’ll go away. Lemme know how it goes. Thanks for this tip. I tried it today on my 99 Camry. I think it worked, as the problem happens only intermittently and the few test drives I did today were successful. There is not much of smoke though, may be I didn’t use the cleaner in large amounts. thank you for the post. i tried it and it worked. the valve was filthy!! i was really surprised by the mess that was in the valve. my ’99 camry is better off thanks to your post. Awesome! I’m really glad it worked and that I could help. It makes me want to make more do-it-yourself posts. I stumbled accross this site after a google search on the same issue. I tried the wd40 as well which is what prompted me to stay see what you conclusions were. A few other sites mentioned the butterfly valve and card cleaner and so I decided to go with your first hand sugestions and give it a whirl. I did park the car at an angle and placed some towels below the valve to catch the cleaner that dripped. After a thourgh cleaning the pedal is smooth just like the day I bought it. BTW, I have a 97 Saturn SL. This was very easy. I appreciate the site and the excellant detailed instructions. Quick question(s), it’s ok if I spray the cleaner past the butterfly valve flap right? I’m afraid that I might spray the cleaner too far in and mess up the engine. Also did you guys wipe down the back of the flap too? The reason our car smoked so much when we cranked it was because we got quite a bit of carb cleaner past the valve. I would try to avoid it by getting the car parked on an angle driver side down, but getting some cleaner past the valve is inevitable. With someone in the car with their foot on the gas pedal, the flap should be in a horizontal position. So, yes, clean the top, the bottom, the front, the back and anywhere along the tube where the thing touches to stop the sticking. I have a 93 Plymouth Sundance and I found the same problem with my gas pedal sticking. It happened again yesterday but this time my pedal stuck FOR GOOD and it’s still stuck full throttle. I turned off the car and got it back to my driveway. Do you think this is the same problem? Should I try cleaning around this valve? Not sure Brian, but it couldn’t hurt anything to give it a try. I have a 97 nissan altima very good car but lately i have had problems with the gas pedal sticking. I clean the throttle body with gumout and the tooth brush, using a entire can off gumout and sprayed the cable and its components with some lube spray. Its alot better but it still sticks a bit. Does anyone have any other suggestions. I looked at the cable and the cable looks very good, however the cable for the cruise control the rubber is a little worn. wow. My camry 2000 has the same problem for almost a year now. At first, it rarely stick. I did have to press the gas pedal down a little bit harder than usual. Nowdays, it happened almost everyday, even on the highway when it’s busy where I stop and go. It’s not a big issue, but it’s very annoying. And sometimes, the gas pedal is hard enough that when I press it, and the tires just spin once it goes. I was gonna take it to the shop, but this look like a 99% solution to try first. Thanks. THANK YOU for this money-saving solution. My 2000 Camry was beginning to have the same problem–very annoying in stop-and-go traffic. It took my son-in-law and a friend less than 30 minutes to correct the problem using your excellent directions. Best Wishes for a Happy New Year!! Glad it worked! Happy New Year! I’ve noticed in my 02 Sentra that this has been happening. Some have recommended taking it into the dealer, but we all know how that usually ends up ($$$). Anyway, my question is that I was unable to get the filter off the throttle body. It’s almost as if the thing is glued to the throttle body. Did you have a similar problem and what can I use to get it off completely? Maybe some WD40? Yesterday I was driving my 95 Camry and noticed that when I let go of the gas pedal the car sped up instead of slowing down. A couple minutes later I had to pull up on the e-brake to avoid and accident. I put the car in neutral immediately and the engine almost redlined without even touching the gas pedal. I turned the car off and then back on and it was fine for about a minute. I made it home and today I cleaned out the throttle body and it seems to run okay. Thanks! Someone told me that one of the vacuum tubes might be cracked and giving me this problem. Anybody ever run into this kinda problem before? Wow!… and I thought having the Gas Pedal stick was dangerous. I’ve never heard of that happening before Chris. Vacuum system sounds like a good guess. I believe the only thing the gas pedal wire passes through before connecting to the throttle body valve is the cruise control system. So it might have something to do with that…but I’m no mechanic. I have this problem with my 2000 Honda Accord. The shop wanted $100 to look at it. I am going to try this first. I’ll let you know. Thanks! The gas peddle was sticking on my on my 1996 Infiniti I30. Just the other day it was raining and when I stepped on the gas peddle from a full stop at a red light, my car took off with the from wheels spinning like crazy. So I said it is time. I tried the cleaning procedure when I got home. I had to take the air filter out with the intake hose. I also had to remove some other vacuums (??) hoses and some electrical connectors. Cleaned all the deposit using a soft bristle toothbrush and carburetor cleaner. Reconnected all and test drove the car. No more sticky gas peddle. Thanks. This is useful! It seems this problem happens to Accords often enough. Last year, my wife paid $150 to fix the sticking pedal and the mechanic was like, “Something about fuel injector…blah,blah,blah” I’ll try this out! Flooding the engine can only happen if the car is shut off while pressing the pedal, right? This tip worked great, but make sure that the plastic tube extender is tightly secured to your can of carb cleaner! When I pressed the nozzle of the cleaner, the freaking tube shot off like a torpedo INTO THE CHAMBER! Luckily, I could see it waaaay in the back of the chamber and was able to MacGuyver a plastic hanger and some duct tape to fish it out….but you should have seen my face when I realzed where it ended up…..simple tasks are never simple in my world! Once I fished it out and actually cleaned the valve….no more sticky gas pedal. Thanks! I HAVE A 99 HONDA CIVIC AND IT IS STARTING TO HAVE THIS PROBLEM…I THINNK I’LL TRY YOUR WONDERFUL SUGGESTION WHICH WILL SAVE MONEY AND HAVE A SAFE DRIVE WITH MY FAMILY WITH ME. PS: CAN YOU USE ANY OTHER TYPES OF CLEANERS OTHER THAN THE CARBURETOR CLEANER? AND CAN YOU PLACE SOME PAPER TOWEL BEHIND THE “FLAP” VALVE TO PREVENT ANY CLEANER FROM GOING DOWN THE AIR VALVE! 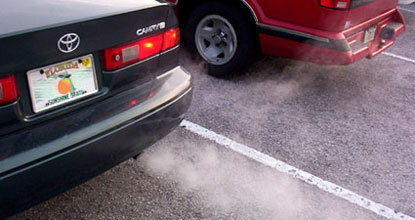 ?….THIS WOULD REDUCVE THE SMOKE TO FOLLOW WHEN STARTING THE CAR. pss: THE CAPITAL LETTERS ARE NOT TO SHOW YOU THAT I’M SHOUTING…I JUST HAVE WEAK VISION! THANKS FOR A GREAT TIP! !..WILL CHECK BACK IN THE FUTURE FOR MORE HELPERS! !..I’LL LET YOU KNOW HOW IT GOES! This is Chris again with the ’95 Camry. Cleaning out the throttle body worked for a couple of weeks and the problem came back. So I ended up replacing my vacuum lines. I found the vacuum lines at ACE Hardware and ended up spending a few hours replacing all the lines. If you end up going this route be sure to label ALL the lines you replace. Under your hood you should have a diagram of where each line goes too. But it’s not that straight-forward so make your own diagram that makes sense to you. It’s been a couple months and everything is running great. Thank you very much for sharing this information. I tried it on my gf 2000 Toyota Camry and it solved the problem. No more complaints from her about the pedal gets stuck. Thank you again. Hey L.L., I’m always happy to here this worked for another person. It’s such an easy fix. Thanks Jason for having such nice web place. It worked great with my ’98 Camry. I finally did it! I must not have used enough carb cleaner because I had no billowy, white smoke. Thank you for sharing this useful information. Now the pedal doesn’t stick… so far. Be careful if you use a straw people! Ditto to the guy above who shot the carb cleaner straw into the intake manifold. The same thing happened to me cleaning the valve on my 2001 camry. Unfortunately, the drink box size straw found its way down the intake pipes and was on the doorstep of the engine block. 3 hours later, two friends and I had the entire intake manifold removed and pulled the straw out the bottom. But hey, that valve couldn’t be cleaner and the pedal doesn’t stick at all now. Eek, I don’t even want to know what a carb cleaner straw would do in there. You’d probably have much bigger problems than just the gas pedal sticking. Hey Wow That darn gas pedal was sticking like no other when I went to drive the pedal would be so hard to press down then once it gave I bascily did a burn out every time I pressed the pedal. I got a 2001 Chevy ZR2 S10 and now the problem is fixed. Althogh it did come back a few days after and I had just upgraded to a beter air filter and now the problem is no more! I tried it, and now my engine light came on…any advice? Thanks! Your solution was great. My 2000 accord v6 gas pedal was sticking as you described, very annoying. I bought some STP Throttle Body Cleaner for $3 and sprayed and wiped out the throttle body. The pedal no longer sticks and the car seems to have better pick up. Funny that I googled the problem and got your solution. The fix at Honda was probably more than $100. Thank you! Christie, If the engine light is on and staying on, you’ll need to hook it up to a computer to find out why. Sometimes Discount Auto Parts and AutoZone type stores will have the computer and will check it for free. Be sure to call them first because even if they do have a computer in the store, they may not be able to test certain makes and models. I’m guessing that it was just coincidental that the light came on after cleaning out the valve. I tried your suggestions and now my camery is running smooth. The gas peddle is not sticking any more. It worked perfect on my 2006 ford ranger, but i still have this one problem with it where when i have it in neutral or driving, the rpm will rev every like five to seven seconds…. what is this problem? please email me with information, as far as the pedal problem, u are awesome man, thank you,. Thanks for the info- worked pefectly on my 99 Accord. I did this on my 1999 Camry, as per your instructions, and it worked beautifully. No need for a friend to press on gas pedal to open the butterfly valve – just manually rotate the gas/accelerator cables yourself. I know I’m only the millionth person to say so, but I’m stoked about this fix. My girlfriend and I are flat broke, but I am at the point that I will spend anything to get that car to stop sticking. My 2002 Ford Escape is a stick shift, so not only is it sticking pretty badly, but it also makes it pretty hard to get going in 1st gear. Yuck. I’m doing this tonight! Thank you so very much. My accelerator was sticking for some time so after reading this article, bought the carb cleaner, checked the hose connection, but didn’t have time to do the job. However, I noticed the battery connections really needed cleaning so I did that. Since then the accelerator pedal works fine every time. I haven’t got around to cleaning the butterfly valve. Should I even bother? If it ain’t broke, don’t fix it. Is there any reason that it could have been an electrical, not a mechanical issue? I’m having the same sticking problem with my 2005 Escape. It happens intermittently especially when its damp out. This morning I pulled out on a highway and it really stuck I’m just glad it was early in the morning and there wasn’t any traffic coming. I was going to take it in to be looked at but this sounds like a less expensive idea. I’m going to try it. Well I am not a person that you find working or rebuilding a car or car’s. My wife keep complaining about her gas pedale sticking and it has gotten worse through out the past several months. I even got tired of having to punch the gas for take off, it was like Nasa launching a shuttle sometimes. Well got on the internet and this was my first site I came across and look at the pix and read what to do. Well it did smoke like crazy but that went away and now I got some major brownie points with the wife. Thanks for sharing your info, it has saved me a lot money, and it only took about 4 minutes. All I can say is ..U R DA MAN Jason..thank u soo much.You saved us lotz of money and it worked like a charm!.I own an entertainment biz. and if you ever need help in that area(music,djs ect..)I’d sure love to return the flavor! I could not believe it — your advice worked perfectly on my 1998 Camry with 144,000 miles on it!! It took me about 10 minutes to completely fix this problem. 1999 Camry…my friends thought I was a bad driver because the car would jerk whenever I would accelerate due to the force I had to apply to the gas pedal….I’m so glad I googled this and found your suggestion. I had virtually no smoke, and the pedal is working wonderfully now. Plus, I actually fixed something on my car, which is fun….thanks again. Your my hero. I cleaned the throttle body in about 30 minutes. I’m sure I saved hundreds vs taking it to the dealer and getting told I needed something replaced! What risk is there to the sensors- intake and exhaust (like MAF and O2)? One response above mentioned a coating in the valve body that may be disolved. Is that just a nuisance or major corrosion problem later? Is this method okay on all makes? Does it break down the oil film on cylinder walls and rings possibly scratching them up and making a real smoking/compression problem later? Are some cleaners better than others for this purpose? Can the cleaner be squirted into the intake while the engine is running to pull it through the whole chamber out through valves and injectors, cleaning them too? Hey, just wanted to say that this really helped me out…i have a 96 toyota camry… my gas pedal was sticking and i thought i would have to spend tons of money to get it fixed…but when i took the throttle body off …it was extremely dirty…sprayed the cleaner on it….and it came out black because it was so dirty….a few minutes later i went to start it and it wouldnt start …when it finally did it killed about 50 mesquitos…haha… but there was a ton of smoke…but no more pedal sticking…thanks! I found this page by googling and thought I’d give it a shot. The accelerator on my 2000 Accord was sticking quite badly, but mostly just on initial take off. Iï¿½d have to push down quite hard on it to get it to go, sometimes Iï¿½d almost do a burnout. I tried pumping the gas pedal a couple of times before cranking to see if that would loosen it up (was told by Honda it was probably a build up of grease on the throttle cable), but that didn’t work. I took the hose off and looked in the throttle body and it looked pretty clean. I actuated the throttle control by hand (you can do it yourself without having someone press the pedal down as someone else posted) and I felt it stick. It felt like it was in the spring / cable assembly more than it felt like the valve in the throttle body, but I thought “I’ve already got the hose off, I might as well clean it.” (I read the stories about the straw and thought I’d try it without using the straw and it worked just great that way, still gives a good stream.) I didn’t get a lot of junk out, so I was kind of skeptical, but it sure did the job. I can’t believe how smooth the accelerator is now. I got no smoke at all, but it did take three attempts to crank. The car now seems to almost jump when I put it in gear, itï¿½s almost like itï¿½s working too good. I know many other people have said it, but Iï¿½ll say it again. Thanks, Jason, for posting this! BTW – the reason the engine doesn’t flood is two fold. One, most engines now are electronic fuel injected, so if the electrical system is off, no fuel is getting pumped. Two, you are holding down the accelerator and not pumping it. Even if it’s not controlled by the electrical system, it will only squirt a certain amount in on each press of the pedal. If someone continually pumped up and down on the accelerator it might flood it, but that’s not what you’re doing here, your pressing and holding it down. Even if you do flood it, let it sit for 30 minutes or so and the gas in the chambers will evaporate and it’ll start right up. This really wokred! People are still coming to this site after all these years. I just fixed my 99camry. took less than 10min. and it even runs better. thanks for the advice and saving me $$ to boot! It took me a long time to find this post, but believe me, I’m glad I did. I have a 99 Camry 5-speed (yes, I have to have one car with a manual) and my 17-year-old son is taking his drivers test in 2 days. The pedal had been sticking worse and worse. But not any more. I followed the directions, but used some throttle body cleaner or something like that instead of carburator cleaner. The carburator cleaner said not to use it on fuel injected engines. Maybe this is why I got no smoke at the end, even though I squirted a lot of that stuff in there. At any rate, the pedal operates very smoothly now. Hopefully this means my son will pass his test. I need him to be running some errands for me! Thanks again for posting this. Okay, I am single and don’t do car repair. I don’t want to affort a repair shop. So…I printed of the directions, got the items needed and enlisted two guys from work. My gas pedal no longer sticks – my 2001 Camry is driving like a dream. They were grateful about the information on smoke that would come out of the exhaust. You saved me worry and money! Thanks so much! I’ve got a 2007 Hyundai Tucson. 4cyl Automatic. Cruise Control was not standard feature, but the dealer offered to put it in through a contracted technician. Vehicle is great, but the gas pedal needs an extra little push to get it moving, regardless if Cruise is on or not. My dealer said it is definitely the cruise control and they have had others complain about it after adding it to their 4cyl Tucson. (standard cruise only available in 6 cyl..weird). Anyway, dealer says there is nothing they can do…although they are going to have the contracted tech look at it on Monday. Your thoughts? Ever heard of cruise control causing this problem with the gas pedal? Thanks. Hey James, I’ve personally never heard of cruise control causing a gas pedal to stick, but knowing how cruise control works, it’s definitely a possibility. If you’re curious, check out The “How Stuff Works” article on Cruise control. Worked awesome on my 2005 Ford Focus as well!! It worked great on my Toyota Camry 2001. It worked great on my 2003 taurus! I just typed gas pedal sticking and it took me right to you! Thanks!! this is amazing, I’ve been busting my brain trying to come up with a reason why. I knew that it couldn’t be the pedal inside the car because nothing seems to be causing the sticking. Anyways, thank you for sharing the information. My Camry is smooth now. Jason, you saved me a ton of money and stress. I just used your system and alas, no more sticky gas pedal. I only wanna suggest the use of Throttle body and air intake cleaner, instead of carb cleaner for fuel injected cars.Only God knows how much some jerk mechanic would charge to fix this. does this apply to a 06 Ford Focus. My wife started hers the other day and the gas pedal would not depress. She turned the engine off and restarted the car and it worked fine. It happened one other time that same day. We were in the middle of an ice storm so it was cold. I am not sure if this qualifies as ‘sticking’. First of all it is true that some manufactures do place a coating to prevent corrosion that carb cleaner may take off. Though in the long run it wears out eventually. Secondly a better cleaner to go with is the Mass airflow sensor cleaner. Just rattle off those last 4 words to any parts store and they will steer you to the right stuff. Why I suggest that is because it is designed for cleaning electrical connections and poses no threat to hoses, while carb cleaner is somewhat more abrasive. Third do make sure as it has been said, to label or color code with finger nail polish if you get into taking many hoses or connectors off. As I go on here and as you noticed it’s not just for Camry’s. Most fuel injected cars if not all to my knowledge have that large butterfly valve that over time will attract nasty deposits. I personally have cleaned my grandmas 95 Olds, more than once, a friends 96 Ranger, my 89 Volvo and have suggested the tip to many others. The Mass Airflow Sensor if equipped is another part of that system that causes hesitation at get up and go, though not a sticky pedal. Personally I have taken both out of vehicles and taken them completly apart at the coffee table to clean them. Not recommended for those not mechanically inclined. Lastly as I put the soap box away. Do make sure everything is put back snug. Don’t use brute force to put clamps back on, but snug them up. If you have air coming in at the hose connection at the valve shown above your vehicle may run rough or die. Much like a loose or cracked vaccuum hose. Furthermore, while you are under the hood take a quick look at your vaccuum hoses. Get some fingerss around them and give em a good pinch and bit of a tug. Check that there are no cracks forming and that they fit well to wherever they go. If you notice anything out of ordinary about them you should consider replacing them. Preventitive maintenance is better than being broke down in the middle of an intersection! well done, thanks a million. I’m getting ready to try this, Does anyone know if this is covered under the Ford powertrain warranty. I’ve read this may viod the warranty becauce of the corrosion inhibitor on the throttle bore and plate?????? You are a LIFE saver! No more whiplash when I am stuck in rush hour traffic! Has anyone else noticed that this problem gets worse when it’s cold out? I never have it in summer, but these Minnesota winters have brought it on every year for almost 8 years! I have a ’94 BMW 540i that seems to have a similar problem. The only difference is that it seems to work just fine in reverse, which worries me that it may be the transmission. After coming out of reverse a similar problem occurs as discussed here, and then happens again when I come to a stop light or stop sign. At a stop I can remove my foot from the pedal and the car doesn’t move at all even on flat ground. Is this still the same, or was the problem only giving it additional gas from a moving idle. Also is it that the gas pedal physically wont move down, or that the car doesn’t react when it does? My pedal is able to be pushed forward, but the car slowly moves forward before engaging and jumping forward as if I floored it. Any suggestions would be great. Thanks! I pulled off the hose to get to the butterfly valve to try your solution on the sticking throttle on my ’92 Honda Accord. My eyes bugged out when I found a huge acorn shell in the pipe. Then, I opened the air cleaner and found a large pile of nuts and chewed air filter fluff! It looks like the sloppy mouse family, comfortably living in my air cleaner, chewed a hole in the filter which allowed the nut shell to get sucked into the butterfly valve preventing it from closing when I took my foot off the accelerator. (Just to be thorough, I cleaned the valve seat with WD40 while I was in there, replaced the filter and put in some chicken wire to keep Mr. mouse from coming back!) Hope it works! I did this on my 04 Chrysler Pacifica and it worked like a champ…saved me $125 as well at my dealership. I used a bottle of carb cleaner that i had sitting around from my motorcycle and just dipped the toothbrush in it. Thanks for the help. Thanks from here as well. you seem to have helped alot of people tha’s good. I have a 2005 Pacifica. Your suggestion worked like magic! Thanks! Your pictures were VERY helpful. Hi! Thank you so much for the info. I tried it in my 98 Camry and it worked perfectly. Only problem I had was that the car didn’t want to start at first because of the residues of the cleaner. In the end, I got the car to start by having the accelerator fully pressed before starting the engine. After this, the engine started working and white smoke started to come from the exhaust. I went for drive to burn it and after that it is just perfect and smooth. I guess I would recomend to go easy on the cleaner and don’t do it with the wife around. your solution sounds great. but i am scared to do it myself with no skill under the car hood. but can you advise, how much a Toyota car dealer will charge to fix this problem on my 1999 Toyota Camry. i am having this problem for the past 3 months. I think I’m having the same problem but I don’t know. Well, I’m starting off college with an old 92 mercedes benz a 200 series I think and the mileages on it is about 180k. Whenever I press the gas pedal half way I’m going about 20mph, on a highway if I’m lucky, I’ll go 45, which is really bad. I don’t want a car that may cause an accident and I’m going to have to much money problems now that I’m starting college. What I’m trying to ask here is would your technique work for this car? I tried this solution on my 2001 Toyota Camry today. The Pedal wasnt sticking much (very rarely) but since I was noticing some loss in power, I gave it a shot and cleaned it. Instead of the Carb Cleaner, I used the Throttle body cleaner which is meant to clean Throttle body only. I didnt get any smoke since I didnt use the Carb cleaner. As far as results are concerned, I didnt notice much change. Reason being that my pedal was fine in the first place. I tried this to see if it improves power. I even changed the air filter with it, so gonna test drive it on a highway to see if improved the power. Seems like your problem isnt about the pedal getting stuck. When was the last time you did a full tune up? If not lately, do that. That might improve things for you. Also change your oil & transmission fluids as well if that havent been changed lately as well. I have been having this problem since last three months. I really had to stomp the gas pedal. Your solution worked like a magic and its is really fun driving again. Also I feel as if my car has more power as well. Worked great for me. Both my wife and 1.5 year old daughter were watching me start it from lawn chairs in the driveway. Had to press the gas pedal to get it started and my daughter started laughing when all the smoke came out. I went to my Nissan Dealership and they offered fix the problem (clean it) for $139.99. I tried this and I think it has really helped. Your instructions were great. Thank you for some great advice! I searched for a long time to find out why the gas pedal on my 2003 Ford Tauras was sticking. I found this site, printed the instructions, bought a $5 can of Carburetor/Throttle cleaner, parked the car as instructed and got to work. What a lot of gunk came out and drained onto the paper towels. Started up the car, it hesitated a bit, but no smoke. Gas pedal is soooo smooth now. I still can’t believe it was so easy! I complained to the service centre folks couple of times, but it was never fixed. Your instructions really helped in fixing the issue. The car is running very smoothly. Haha. I have a 94 ‘Rolla with the same problem. Did this today by myself(used a text book and an empty oil bottle to keep the valve open). Boy was that thing dirty!! Cleaned it out, no white smoke though. I was surprised how little I have to push my gas pedal now. What he is suggesting is cleaning the throttle body of the car. This is an every 40K issue that needs to be done on every car. Have someone hold the pedal down and keep it down! Next like he said pull off the air inlet tube that comes off the filter house. Then have your friend press and hold pedal. As he said use an approved cleaner because some cleaners can effect throttle bodies differently so just make sure your ok first with the parts store. Spray a rag and the area to be cleaned. Wipe down and you are finished. As the author said very easy anyone can do this with a helper. Just be very careful to have them hold the pedal as it can hurt or pinch you. Just did this and it worked marvelously. Thank you so much for the info! Ihad the same problem almost got killed when my car leaped into an intersection. Only now the pedal goes to the floor but there is no pressure. To late for your advice? I did this today. Worked like a charm. Thanks so much! This worked great! I used Ai-Intake Cleaner, which is right next to carboretor cleaner on the shelf. No smog afterwards. Also, the check engine light came on, so I had to do this http://www.troublecodes.net/toyota/ . Thanks for saving me money! It’s amazing how long this thread has lasted. Good detail on fixing a sticking gas pedal. FYI- Also note: Toyota has a recall on sticking gas pedals in several models and years of Toyota. Looks like I am going to attempt this on my fiances BMW this weekend. Jerk didn’t even warn me the pedal sticks. This thing is a 98′ and has over 300k miles on it. Was driving today and the pedal pulled away from my foot and stuck to the floor. I texted him that I’m tearing his car apart this weekend! Good thing my dad and brother taught me how to turn a wrench! ©2002-19 Jason E. Beaird. — All bytes reserved.